AUMUND offers a range of specialised systems for discharging bulk materials, which have difficult and varying flow properties. AUMUND India’s recent successes in sales of this type of equipment prove the power industry’s confidence in the technological solutions provided. HAMtek Technologies India Private Limited is a general contractor, designing and manufacturing coal handling plants. 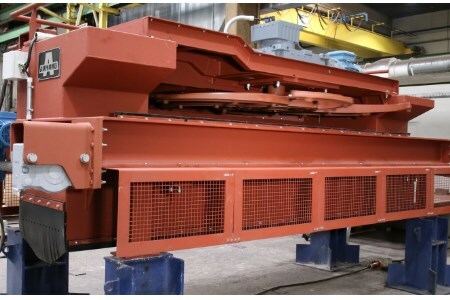 Its customer, Meenakshi Energy Private Limited has a 2 x 350 MW coal-based thermal power project in Nellore District, Andhra Pradesh State, for which HAMteck has chosen two rotary discharge machines type LOUISE BEW-FL from AUMUND India. This type of machine is specially designed for use in height restricted site situations. The two machines supplied for this project will extract coal from a 25 m long hopper. They are designed with single-sided discharge, 3000 mm discharge wheel diameter and capacities of 120 - 1320 tph. AUMUND India is also working on a further thermal power plant project in India, where eight rotary discharge machines are being considered. They are type LOUISE BEW-BL with double-sided discharge, 3200 mm discharge wheel diameter and capacities of 100 - 300 tph, for the extraction of coal from covered stockpiles. This discharge technology also finds its place in the cement industry. AUMUND India won an order from Humboldt Wedag India, Pvt. Ltd. for two CENTREX® machines for Republic Cement’s Bulacan Plant in the Philippines. These two machines, type CTX AV, with external drive unit and stationary inner cone, will extract gypsum and pozzolana from the silos. They have 3500 and 4500 discharge wheel diameters and 1.5 - 15 tph and 9 - 90 tph capacities respectively. The drive unit of the CENTREX CTX AV design is fitted to the discharge bottom for easy access. This design also features radially arranged support plates connecting the inner cone with the silo wall. This alternative with external drive and stationary cone offers ideal conditions for applications involving a high torque and requiring easy maintenance.